holotype worker only found and described (see Bolton, 1995) . TL 3.2 mm, HL 0.8, HW 0.6 mm. Colour uniform dark red, darker than the related weberi, appendages yellowish. Separable from weberi by the head details - finely reticulated and matt; thorax without reticulation, with large puncturations and the outline of transverse rugae. Eyes reduced to 4 facets, 4 times further from the mandibles than their length. Antennal lobes more rounded. Clypeus punctuated, not sinuated, anterior border almost rectilinear, with a very fine point. Mandibles bluntly widened, 9 equal, large, contiguous, yellow teeth. 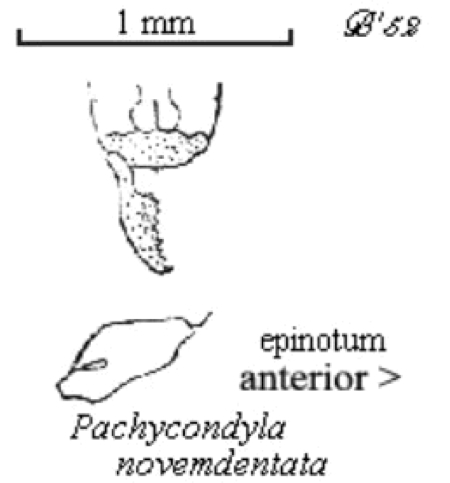 Propodeum (epinotum) and petiole scale similar to weberi. The photomontage of a syntype worker is collated from http://www.antweb.org/specimen.do?name=casent0915478.